THE PEAK SEASON IS UNDERWAY AT THE PORT OF VIRGINIA: “We are seeing the large vessels with regularity,” said CEO John Reinhart. Calendar year totals show strong volumes across all modes of transport at Port of Virginia. Port of Virginia saw TEU growth of 7.5 percent in July. 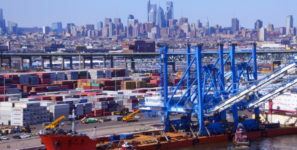 The Port of Virginia moved 234,230 twenty-foot equivalent units (TEUs) in July, which is growth of 7.5 percent when compared with the same month last year and a record as the best July cargo performance. On a calendar-year basis, total TEU volumes are up 8.1 percent; containers are up 8.5 percent; rail is up 5.6 percent; trucks are up 9 percent; and barge cargo is up 30 percent. “The peak season is underway, we are seeing the large vessels with regularity and handling their corresponding cargo volumes safely and efficiently,” said John F. Reinhart, CEO and executive director of the Virginia Port Authority (VPA). “The North Gate at NIT (Norfolk International Terminals) is fully-functional and motor carriers are utilizing that asset more and more, which will be important as we near the start of work this fall on renovating the south-side stack yard at NIT.